On the sixtieth anniversary of the 1942 roundup of Jews by the French police in the Vel d'Hiv section of Paris, American journalist Julia Jarmond is asked to write an article on this dark episode during World War II and embarks on an investigation that leads her to long-hidden family secrets and to the ordeal of Sarah, a young girl caught up in the raid. This is without a doubt the best book I've ever read. I was actually reading it during finals today, and I reached the saddest part in the book and began to cry. This book touched me and made me think like no other book ever has. In July of 1942 the German army ordered the French police to round up Jewish citizens in Paris. The prisoners were brought to an indoor sporting arena called the Velodrome and the incident is now know as the Rafle du Vel' d'Hiv. The prisoners suffered for days in the Velodrome, eventually were removed and taken to a transit camp then on to Auschwitz. This is the basis for the novel Sarah's Key by Tatiana de Rosnay. Sarah is 10 years old and is rounded up with her parents. She locks her younger brother in their secret hiding place promising to return soon. Julia is a journalist, an American married to a Frenchman, who is working on a story about the Vel' d'Hiv. Through her research Julia finds a disturbing link between her husband's family and that of Sarah's. This book sounded so interesting to me and I was thrilled to get a copy from LibraryThings's Early Reviewer's program. The first half of the book is told from the alternating perspectives of Sarah and Julia. At first, it felt as though the author was going back and forth too quickly, but as Sarah's story became more intense the pace felt right, and Julia's story was a bit of a respite. During this part of the novel, I really couldn't put this book down. Sarah's voice was so authentic and she is a brave and heroic character. Halfway through the book, the story changes and is told only from Julia's perspective who is still researching what has occurred in the past. I didn't feel this part of the novel was as strong as the first. Even though Julia is respectful of the situation she had a self-centered way of approaching the story of Sarah - how it made her feel, how it affected her life - that bothered me. There is a climax about 30 pages before the end of the book and I felt that those last 30 pages were somewhat superfluous and didn't fit well with the rest of the story. I felt they would have been better condensed as a few page epilogue. In 1942, thousands of Jewish children, women, and men were herded into a stadium in Paris--the Vel'd'Hiv'--and summarily shipped off to concentration camps, mostly to their immediate deaths. That this roundup was executed by the French police (not the Nazis) and that it was mostly expurgated from the mainstream of French history darkens an already dark chapter. "Sarah's Key" follows the fictional story of one young victim, a 10-year-old girl, and a modern woman whose life whose life intersects with hers in mysterious ways. The story is part mass market thriller, part didactic history lesson, and part novel, a well-crafted but poorly-written page-turner more akin to an action movie than a work of literary subtlety. It was about a third of the way into "Sarah's Key" that I started wondering if it had been originally written in English (t was). I scoured the title pages for translator credits; I surfed the Web for data. The author, Tatiana de Rosnay, is French, so it would be feasible that that language is where this began. I did this research because I was hoping that there was a reason that the language was as dreadful as it was. I wanted to be able to blame someone other than the author for the stock, jarring phrases like "eyes white with fear" and "speechless with terror." At one point, speaking of a matter of life and death amongst the characters, de Rosnay has the young girl worry franctically if, by locking her very young brother in a hidden cabinet when the police come to round up her family, she has "let him down." Let him down? "I let him down" is a reasonable thing to say when you miss your kid get a home run in his tee-ball game because you're working late at the office. It seems a wildly inappropriate (not to mention anachronistic) way to describe a child's potential death. Perhaps this was on purpose. But it smacked of a carelessness with words that I found difficult to ignore. The effort the book makes at bringing an obfuscated, shameful piece of history to the fore is noble. de Rosnay is right, most people have not heard of this tragedy. But what's missing, except for brief mention, is the broader context of the French Occupation and the Vichy regime. France's political paroxysms during WWII are complex, and I'm not going to pretend I understand them (yet). I would have appreciated a lesson in how the Vel d'Hiv' tragedy plugged in to what was going on in a broader sense. de Rosnay condemns the French policemen for carrying out the grim task, and though she does have a character that breaks out his jackboot role, the rest of the force is portrayed as thugs blindly following orders. One has to question what the motivation was, what was really driving it. What I can credit the work with is its inventiveness of plot. I hesitate to pigeonhole something about the Holocaust as a "beach read" but it has that tempo, a Dan Brown-ish Byzantine intrigue, that seems to suggest the genre. At an early point in the story, I paused and made specific predictions about the resolution of the story arcs. I was wrong about nearly all of them, which was redeeming. This review WILL CONTAIN SPOILERS and CAPSLOCK because I have so much to rant about. The first 100 or so pages of this book are good. Not particularly well written but the story is intriguing and there is some genuine emotion. I was moved when Rachel was re-apprehended by the Nazis because she fought so hard and became so ill, all for nothing, that it was tragic. More tragic than the situation with Michel if you ask me. I liked Sarah's chapters. Where this book fell absolutely flat to me was Julia and her 'plight'. But a few things I'd like to mention about the people around Julia first. Bertrand. I didn't understand why Julia claimed to love her husband and find him so charming but all she seemed to feel toward him was contempt and annoyance. And rightly so because he was an arrogant jerk! Julia's daughter Zoe was ...not a child. At all. I'm so sick of the wise-beyond-her-years kids. Sarah had a reason to be mature, Zoe was just badly characterized and a tired trope. Finally there's Julia herself. I really, really didn't like her. At first I just found her boring in a "Bleh, get back to the tragedy of human suffering!" way but as the story progressed and Sarah's chapters were dropped I began to find Julia, her problems, and her goals insufferable. So, ok, you're pregnant after 2 or 3 miscarriages and your husband doesn't want the kid. Yes, that's a problem and I was mildly curious how it would turn out. But then you decide not to go through with an abortion because this baby is the most important thing in your life. So you randomly fly from Paris to the USA. In the matter of days. And then you feel a little annoying 'tug' and think nothing of it. WOMAN YOU HAVE HAD 3 MISCARRIAGES, YOU ARE IN YOUR MID 40'S AND ARE RANDOMLY GALLIVANTING ACROSS THE GLOBE GHOSTCHASEING BUT YOU CLAIM THIS BABY IS THE MOST IMPORTANT THING YOU ARE A HORRIBLE, IRRESPONSIBLE, SELFISH PERSON AND A BAD MOTHER! Even all that aside, the amount of arrogant rich white woman hubris Julia has is revolting. Why should she dig up the past? What right had she? Obviously Sarah wanted to keep it behind her. Obviously she didn't want to burden her family with it, nor the Tezac's wish to remember the burden of it either. And then of course there was all this eternal monologue about how Julia "would always remember the tragic day they rounded up those Jews" and "She knew what it was like" because she wrote an article about it. That is just as bad as "I know what it's like to be in a wheelchair/blind/raped because I played one on TV". Finally, the writing. While the writing wasn't strong, I never really seemed to notice a problem with it until near the end. The word "Ironic" 4 times in 4 pages? Really? And it was "ironic" that you missed Paris after moving back to New York? No it wasn't! Remember near the beginning of the book Julia, where you said you had always loved Paris, more than in the romantic cliche way, but in all the other ways? You had always felt a tug and longing from and for Paris! You met your husband there, you had friends there, you had your daughter there, you had a good career there. Of COURSE you would miss it! There is nothing ironic about that! There was an awful lot of telling, not showing. One of the most blatant examples occurs after she almost has a miscarriage and is told to lie down and work from home. We're told that. And the time just zooms by! We don't get Julia's frustration at being bed-ridden, at her lingering pain or guilt that she almost caused the loss of a third or fourth child, or anything like that. Nope! "I remained horizontal while my 11 year old made me breakfast in bed for X amount of days." Am I supposed to be getting some sort of parallel from all this? How humanity hasn't change much since the Holocaust? That the problems of the upper-class are just as valid as the tragedy of thousands rounded up then carted off to death camps? You know what? I was going to give this book 2 stars but no. One. One star for Sarah and Rachel and Michel. No stars for the rest of this book. 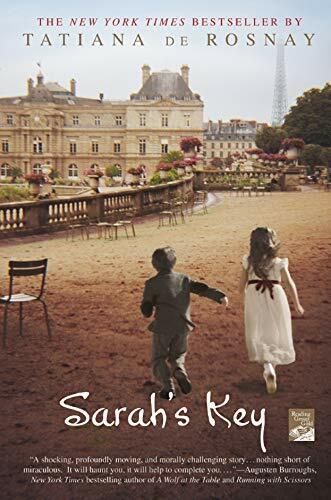 "Sarah's Key" consists of two parallel stories, the contemporary story of Julia, a journalist researching the events surrounding a roundup in Paris by the French authorities of Jewish families in 1942 and the story of a young girl, the titular Sarah, caught up in the nightmare. The novel jumps back and forth rapidly between the two stories in a way that makes Julia's personal problems seem insubstantial and petty. It's difficult to sympathize with her marital woes when they are interspersed with the struggle of a ten-year-old to survive the destruction of her family and life in occupied France. The key in question opens a small hidden cupboard in which Sarah has hidden her younger brother, expecting to be back in a few hours. The suspense surrounding her brother's fate is settled halfway through the book and is particularly well handled. Julia is a fascinating character and it is unfortunate that she is so overshadowed by Sarah. The death of a relationship, the expatriate experience and the concept of "home" as well as the way we become emotionally bound to a baby while it is still a small bundle of cells are all themes Julia's story takes us through. Her French family's reaction to her research is varied and nuanced. Sarah's Key by Tatiana de Rosnay is an on the edge of your seat page turner. Again we go back to WWII and the Holocaust. Seems most of my book choices end up there whether I want them to or not. The story is about a young girl about 10 years of age and her family during the Paris Round up of Jews in the Vel' d'Hiv' of July 1942. Her father knows that the Jews are going to be taken but the Paris police have just been taking the men so every night he sleeps in the basement. This particular night the police come to take them all. The mother freezes up, the daughter hides her 4 year old brother in a false wall and locks him in thinking she will be back in a day or two and that he will be safe there. As they are being loaded into the truck, the father runs from his hiding place to be with his family and the daughter has a difficult time getting him to understand what she did with her brother. The police will not allow the father to go back to get the boy. The girl escapes from the camp once they have separated the parents and children. She must get back to Paris and save her brother. This is the plot of the story and it is so interesting to find the people who are willing to help the girl and those who are not. July 16, 1942. The French police rounded up Jewish families to be taken to Velodrome d'Hiver,an indoor stadium known as Vel' d'Hiv for short. Thousands of Jewish families were locked up there for days before being shipped off to Auschwitz. Sarah is a young girl who hid her brother in a locked cupboard in their apartment to be kept safe until her family was released by the police.She promises to come back for him. Sarah did not understand what was happening and that she wasn't to be going home. Once she does, she is desperate to get to her brother, to save him. July, 2002. Julia Jarmond is an American writer who has lived in Paris for the last 25 years. Her boss wants her to do an article on Vel' d'Hiv as the sixtieth anniversay approaches. This causes tension between Julia and her French husband Bertrand, as the French did not want to be reminded of that dark period in their history. The first half of the novel alternates between Sarah's story and Julia's search for information. Julia discovers a link between her French family and Sarah. The second half of th book is Julia's search to discover what happened to Sarah, while dealing with the changes in her life and marriage. This is easily one of the best books I have read this year. Sarah's story is heartbreaking as she discovers the horror of what is happening to her and her parents. The woman had little by little disappeared. She had become gaunt and pale, and she never smiled or laughed. She smelled rank, bitter. Her hair had become brittle and dry, streaked with gray. The girl felt like her mother was already dead. Not only was this story well written but it brought to my attention the plight of the Jew's in France, something I did not know that much about. The book is heart-breakingly beautiful and touching, a story that will stay with me a long time. I read this in two days because it was so riveting. You won't be disappointed in this brilliant novel. I did not know anything about the French roundup of French Jews in Paris in 1942. This story begins with the roundup of a ten year old girl, Sarah, and her family. Sara manages to hide her four year old brother thinking that the family will soon be back to open the closet he was locked in.. The family instead is sent to Vel d'Hiv. a French stadium just outside of Paris and given only the minimum amount of food and water. Sarah becomes desperate to return to the apartment so she can free him. Her parents are no help as they are unable to do anything.
. It is also the story of an American woman, Julia Jarmond who has lived in Paris for a number of years, is married to a Parisian, has a troubled marriage and has an eleven year old daughter. Julia, a journalist. is assigned to cover the 60th anniversary of the Vel'd' Hiv roundup. In her investigation, she finds out that the apartment she and her husband are planning to move to was one that his parents moved into after the Jewish occupants were removed in that roundup. She becomes obsessed with finding out what happened to the former occupants who she learns were Sarah and her family and what her in-laws knew about these previous occupants. The story is told in alternating chapters in the beginning and then we lose track of Sarah until Julia find out her complete story with the help of her inlaws and others. Sara is a very resourceful little girl and does eventually make it back to Paris to discover what happened to her brother. Julia has to make a painful decision as to whether her marriage is worth saving. Why did I have this book for so long and not read it? Who knows-it was really an amazing story. I have always enjoyed books from the World War II time period, and this one was no exception. The first half of the book alternates characters and time periods with every chapter. So you get a glimpse into Sarah Stargynski's life in 1942, and also Julia Jarmond's in 2002. When you consider the brutality of the Holocaust, it was kind of relieving to read a chapter that took place in 2002. It was a nice little break that let you catch your breath. The book starts out with Sarah Stargynski in 1942 who is living with her family in an apartment in Paris. Since her family was Jewish, they have been selected to be arrested as part of the Vel' d'Hiv' roundup that took place on July 16th, 1942. This is a part of World War II history that is not spoken of often, but obviously had a dramatic affect on the Jewish population in Paris at the time. Although this book is fictional, it is important to realize that the Vel' d'Hiv' did actually happen. Jewish people were rounded up, some adults were sent to camps right away, while parents and their children were held in a stadium for days until adequate transportation was provided to transport them to the camps. The indignities that these people had to endure during this time were obviously just the start of their nightmares, since they didn't have any operating toilet facilities, and very little food and water. Although these orders to commit these atrocities were from Nazi Germany, the actual round-up and transporting of these innocent victims was completed by the French police. When Julia Jarmond is introduced she adds a new element to the story. Julia is a journalist and her current assignment requires her to research the events from the Vel' d'Hiv. As Julia researches the events from that horrendous day, she uncovers a connection between her family and Sarah Starginski's family. As Julia follows Sarah's journey she uncovers the atrocities that were committed against the Starginski family. While Julia retraces Sarah's footsteps she finds herself at a train station that has been turned into a day care center. As Julia's quest for information about Sarah goes on, she finds herself struggling with events that take place in her personal life. She has a wonderful daughter of her own and is married to a good looking man that seems to be only concerned about his own well-being. After learning about the Vel' d'Hiv, Julia finds herself questioning the life that she has led with her selfish husband. She finds herself appreciating life in a new and fresh way. We experience the hardships that Sarah experienced through this book. Although I really enjoyed the book I can't say that I particularly enjoy reading Holocaust events. To think that human beings were actually treated this way just burns me up inside and makes me so angry! A few years ago I took a Holocaust class, so even though I do feel pretty knowledgeable about the subject, I still did not know much about the Vel' d'Hiv round up. I think this book was very historically informative about that event. This book was recommended to me by several friends. I am kind of saturated of WWII books lately, but I picked it up anyway. The plot of the book is interesting though not particularly fresh. The beginning of the book alternates between a 10 year old Jewish girl in occupied Paris in the summer of 1942 (her name is not given until the middle of the book even tho it's in the title of the book), and Julia. Julia is an emotionally immature 45 year old American woman, married to a French man, living in Paris with her 10 year old daughter in 2002. Other than Sarah, the characters in this book are two dimensional and not particularly complex. The dialogue is flat and unconvincing. Julia's emotional immaturity and self-doubt became annoying as the book progressed. And the author's subliminal suggestion that there is a parallel between the Holocaust genocide and abortion is insulting. Genocide is an act carried out by the state against a group of ethnically identifiable group of people. Abortion is a painful personal decision by a couple that has little to do with the state. Sarah's Key explores the tragic history of the arrest, detention, and execution of thousands of French Jews from the perspective of a fictional 10-year-old Jewish girl named Sarah. Sixty years after the Jews of Paris were rounded up by the French police in July of 1942, American ex-patriot Julia Jarmond is assigned to write a piece on this event by the editor of a publication for Americans living in France. Although Julia has lived in Paris for several decades and is married to a Frenchman, she had never heard of this event. As she learns more about the French government's role in the round-up of the Jews, she is increasingly horrified by the silence of the French people, including members of her own family, who witnessed this event but act as if it never happened. When Julia discovers a connection between Sarah and her husband's family, she becomes obsessed with finding out what happened to Sarah after her arrest. Is it possible that Sarah was one of the few children who escaped death at Auschwitz? Sarah's Key is the story of a young girl and her family who are taken in the Vel d'Hiv roundup and deportation in 1942 Paris. The story grabbed me from the very beginning and I didn't put it down until I was finished. In the first chapters the author alternates between Sarah's story and a modern day journalist who is assigned to write about Vel d'Hiv on the 60th anniversary. While not usually a fan of stories that flip-flop between time periods, these chapters were short enough that I didn't lose track of who was who and what was happening. But the format abruptly changes and the rest of the story is told only by the journalist as she tries to find out what became of Sarah. Mixed in with the whole mystery is the journalist's life drama which got to be a bit tedious when I really was much more interested in Sarah's story. Julia Jarmond, American journalist settled in Paris and married into the wealthy Tezac family, is assigned to cover the sixtieth anniversary of the July 1942 Veldrome d’Hivers roundup, the arrest and subsequent deportation of thousands of Jews which took place in Occupied France. Julia discovers that the Tezac family apartment she and her husband, Bertrand, are renovating, belonged to the Starzynski family, which was dispossessed of its home in the roundup. One discovery leads to another, and Julia learns that Sarah Starzynski, a child of the Vel’ d’Hivs’, may still be alive. She sets out to find Sarah, her pursuit relentless and by turns reckless. This shattering account of the roundup of Jewish families by French police in Paris on July 16, 1942 provides the background for de Rosnay’s novel, which is clearly an excuse to tell this important story that has been largely overlooked by Holocaust literature. Over 13,000 Jews including 4,115 children aged between two and twelve, were arrested, deported, and sent to the crematoria of Auschwitz, after a horrifying transit via cattle cars to concentration camps along the way. There were few survivors of The Rafle du Vel’ d’Hiv (the name given to the raid, after the Velodrome d’Hiver - the indoor stadium in which the Jews were gathered, starved, sickened, and disheartened before their ensuing transit to the camps). De Rosnay tells this moving and unforgettable tale through two alternating voices: Sarah, a ten-year old girl who was taken by the police but escaped, and Julia, a modern-day reporter in Paris who has been given the assignment, on the 60th anniversary of the Aktion, of finding out what actually happened. Julia has a difficult time locating surviving spectators who are willing to talk. It was especially sensitive for the French because it was the Vichy government, not the German Nazis, who carried out the roundup, and also because most Parisians just closed their eyes to what was happening. Thus they did not want to be reminded of a past so freighted with accusation and guilt. Julia becomes fixated on the story, with her research carrying her far beyond what anyone anticipated. It is Sarah’s story, however, that is so powerfully crafted, that you feel as if you are experiencing, along with Sarah, her vulnerability and fear and the horrible pain and agony of loss. I have read a number of non-fiction books on survivors (such as the haunting "New Lives: Survivors of the Holocaust Living in America" by Dorothy Rabinowitz) and de Rosnay gets this part just right. Sarah’s elegiac words on the memory of 1942 – “Zakhor. Al Tichkah.” (Hebrew for “Remember. Never forget.”) – were also the words spoken by Jacques Chirac at the inauguration of a Holocaust Memorial in France in 2005. This has got to be one of the very worst books I've ever read. The writing is ham-handed in the extreme. There is absolutely no character development, and absolutely no ambiguity: essentially every character is either all-good or all-evil, and the only exceptions are the ones that are unexpectedly good at exactly the moment required to rescue one or the other of the two heroines. The dialogue is clunky and unrealistic. This is especially true of the 11-year-old daughter who speaks like a sage counselor, but the dialogue is awkward throughout. After having read just the first few pages, I felt as though I could write the entire remainder of the novel--the foreshadowing was that clumsy, and the plot "twists" that predictable. The reliance on trite, overused phrases was agonizing: one or another character "squared her shoulders" more than once, an old man was "grizzled," that sort of thing. The novel is as pedantic as you can imagine. If you had a nickel for every time she reminded you that it was French, not German, police that rounded up Jews for deportation and annihilation at Auschwitz (not to mention the horrifying conditions in the deportation camps), then it would certainly pay for the book--but save the money for something of higher quality, such as the toll on the New Jersey Turnpike. This author simply does not know how to write. Aside from the horrifying history that it describes and the occasional four-letter-word, the writing is at the level of not-very-sophisticated juvenile literature. If you want a better written juvenile-lit depiction of Nazi horrors based on historical events, try "Escape from Warsaw" by Ian Serraillier or even "Snow Treasure" by Marie McSwigan. This is one of those books that you wish had been written by another author. The subject matter is important and interesting and sheds light on a horrifying period in human history, but the novel simply doesn't do it justice. The writing is amateurish* and clichéd, the characters one-dimensional to the point of charicature and the author's choice of mixing up truly tragic past events with some present melodrama-rama makes the novel feel shallow and vaguely exploitative. The message of Tatiana de Rosnay's new novel is "never forget" the atrocities of World War II. That very message is spelled out several times in the text. But it's hard to remember history that you've never learned, and a story you've never heard. De Rosnay's novel aims to rectify that for one dark event in France's history. In July of 1942, thousands of Parisian Jews were rounded up in the middle of the night and corralled in the Vélodrome d'Hiver or the Vél' d'Hiv' for short. They were predominantly women and children, because many Jewish men had gone into hiding. After days of being kept in inhumane conditions and in fear for their lives, these families were shipped off to internment camps outside Paris, and eventually almost all were murdered in Auschwitz. For obvious reasons, this is not a proud moment in French history--because it wasn't even the Nazi's who did this. It was French police and French officials who perpetrated this crime. It is an event that is largely forgotten today. I, for one, had never heard of it. The first half of the novel is broken into two narratives. One, set in 1942, is the story of 10-year-old Sarah. When the police come to her family's door, Sarah's 4-year-old brother Michael hides in a secret cupboard the two of them play in. They keep water and a flashlight in there, so Sarah lets Michael stay hidden in the locked cupboard. She pockets the key, assuming that they'll be returning in a few hours. She promises Michael that she'll be back soon. In short alternating chapters, we are also following the story of American journalist Julia Jarmond. Julia's married to a Frenchman and has lived in Paris for more than half her life. She writes for a magazine for expatriates living abroad, and is assigned an article on the upcoming 60th anniversary of the Vél' d'Hiv' roundups. Julia is unfamiliar with this event, but is quickly shocked by the extent that Parisians have whitewashed this unflattering event from their history. Not only do most not remember the events, but many people she talks to actively resist hearing about it. But, like a good journalist, Julia follows leads, meets the right people, and becomes very emotional about telling the story. Eventually, Julia realizes that this piece of forgotten history intersects with a part of her family-by-marriage's history. No one wants her to dig into the past, and when all the ghosts are eventually revealed, the responses of those whose lives are touched are fascinating. It is no surprise that Julia's research intersects with Sarah's story. Eventually the two narratives merge into one story now being told from Julia's perspective. But much of the tension that keeps you turning pages quickly is your desperate desire, like Sarah's, to learn Michael's fate. However, that truly is not the whole novel. There is more to Julia Jarmond than just her role as a researcher. I felt that the novel had something to say about who the protagonists and who the villains are in the stories we live. Not just in times of war, but even in a marriage. Conflict is viewed from differing angles, and things are not as clear cut as you may initially think. Characters are depicted in shades of gray, which always makes for interesting reading. I wasn’t sure how the back and forth chapters between one girl in 1942 and a different woman in 2002 were going to work for me, but this story is so well told. I thought I’d be interested in the 1942 story but wasn’t sure how much I’d become involved with the 2002 story, but much to my relief I enjoyed both stories, although I did think Sarah’s 1942 story was slightly stronger than Julia’s 2002 story. However, I do think my favorite character might be Zoe from the 2002 story. Reading this was chilling, suspenseful, devastating, heartbreaking, and heartwarming. It’s about loss and the destructive power of secrets, both of which are subjects close to my heart, so it was very emotionally powerful for me. I thought that the author created perfect cadence in her writing style; I loved it. I read it in two days as I was loathe to put it down. The tale seemed mostly authentic, occasionally something rang slightly off but I didn’t take note and those moments were ones I forgot because the story as a whole rang true. It’s one of those tales made as vivid by fiction as by a non-fiction account, not diluted at all by the parallel story lines. There were a couple of plot points that I think were meant to be subtle mysteries and that were glaringly obvious to me ahead of the reveal but, even though I noticed them and could tell the author was not being as clever as she meant to be, they did not really diminish my enjoyment of the book, but they did almost cause me to deduct a star from my rating. I was ignorant of the specific event that took place in Paris in Nazi occupied France that’s the center of this story and I’ve read a lot of non-fiction and fiction holocaust books; I really appreciated this one because I do always enjoy learning new things, however disturbing. The back of this paperback (advance readers’) edition has an author interview, historical perspective notes, recommended reading (many of the listed books will now go on my to-read shelf) and reading group questions. The story about Julia Jarmond, an American journalist living in Paris, doing a story about the Vel' d'Hiv's 60th anniversary of the French round-up of Jews during World War II. While doing this story she discovers a connection to a young girl, Sarah, who was taken in the round-up and her husband's family. I really enjoyed this read. Well almost. For the most part, I really enjoyed how the Tezacs and Sarah’s family are intertwined from past to present. The writing in the book is excellent and the plot itself is compelling enough to keep you engaged and reading until you finish. It may not be a very well known particular incident in Holocaust history and definitely worth looking into for more information - I myself didn’t know much about it until I read the book. The perspective switches from Sarah to Julia. Naturally, Sarah’s story is much more interesting and compelling. You feel for her situation and her poor brother and can only think of the worst possible scenarios for her. I admired her for her determination and strength for a girl her age. It was such a great story to read and I loved it when I reached the sections featuring Sarah. I wish I could say the same for Julia though. I didn’t care too much except for when it linked her family with Sarah’s. However the parts with Julia’s marital issues with her family? not my sort of thing and wasn’t much to my liking. I mean, okay good for her for standing up to her decisions and whatnot, but it wasn’t as interesting. Plus, towards the ending, Julia became whiny and her story just dragged too much. I was rather hoping for more about Sarah and what she did in greater detail after the war. This is the Story of Sarah, a little girl who even when terrified herself, looks to protect her little brother. Sarah was taken away from her home, and then from her parents when French police gathered Jewish families, to send them to their deaths simply for who they were. This is the story of neighbors betraying neighbors. People who closed their hearts to the people they had known for years, for the reward of some cash in hand and perhaps their own safety. This is a story of love and compassion. Heros in every day life who took it upon themselves to save little children. Particularly one family who took one such child to their hearts and into their family. Sarah's Key tells the story of Julia. A woman who comes into her own when she too, stands up for a child and saves a life. It reminds us how fragile life is, and how many ways our own lives are entangled with the lives of others. It begins in 1942 in France, and ends more than sixty years later . It is a story of horror and death, It is a story of love and life and joy. I was invested in the characters from page one. By the time I closed this book, they were friends that I will miss, but will visit again. I will recommend this book to others, many others. This is a book that I will give as a gift, share with my children and friends.